CI Learn (Canvas) has a ton of functionality, as we all know, but there are some hidden gems in there that make it even more useful. Below are some of our favorite tips and tricks to help you get the most out of CI Learn during your semester. Have a long list of courses from previous semesters cluttering your dashboard and course list? Don’t fret. You can easily control which courses appear in those areas via the All Courses page. From the all courses page, click the star icon to the left of the courses that you want to be visible on the dashboard and on your courses list. That’s it! You can always come back to the all courses page to make others visible again. Hint: If some of your students are reporting that they’re unable to see your course when they login to CI Learn and you know that you’ve published the course, have them check to make sure that the course is starred on their all courses list. You can also refer them to our CI Learn Student Quickstart Guide. If you accidentally delete a page, or even an assignment (yikes!) that you didn’t mean to, don’t worry! They can be recovered. This can be done by typing /undelete after your course URL. You’ll then be taken to a screen that will show deleted files along with a restore button. Simply click “restore” to recover any deleted materials. Be sure to verify the materials after restoring them. This little trick works pretty much exactly like the undelete trick above, except you type /rubrics after your course url. You can also add new rubrics to your course from this screen without having to create the assignment first. This can be a time saver if you know that you’re going to be using multiple rubrics throughout your course. 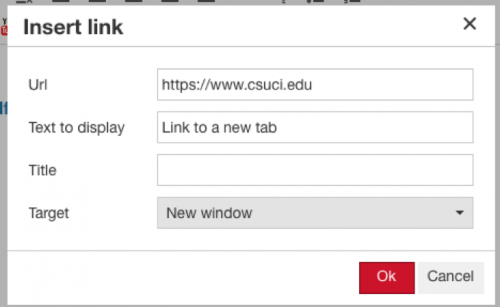 Sometimes you may want links in your pages to open in a new tab so that students don’t lose their spot in your course. You can do this by pressing Ctrl+K or Cmd+K after highlighting the text that you want to be linked. After pressing the keyboard shortcut, you’ll have the additional option of making the link open in a new window. One of the most useful times to use this trick is after copying a course to a new semester when you’ve removed all dates from the previous course. Instead of editing each individual assignment within your course, which can be quite time consuming, you can actually set due dates in the Calendar. 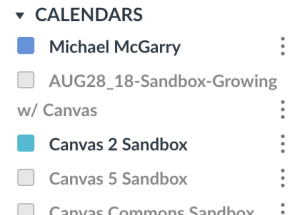 In addition to having a quick-edit functionality, the also calendar features a drag-and-drop interface where assignments can be dragged, dropped, and moved around. Within the calendar interface, you can easily drag and drop an assignment to a different day to change it’s due date. Or, in the aforementioned situation where you’ve copied a course over and removed all previous dates, you’ll find your assignments under the UNDATED heading to the right of the calendar. You can drag assignments out from the undated section onto a specific date to make that the due date for the assignment. By default, the due date will be changed to 11:59pm on the date that you drag the assignment onto. 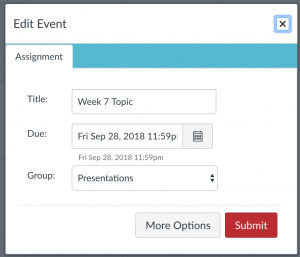 As an alternative to dragging and dropping assignments on the calendar, you can simply click them and then click the “Edit” button to bring up their date and time options. You can also edit assignment names and which assignment group an assignment has been added to from this quick-edit window. A pro-tip to making this as simple as possible: Deselect any calendars for courses that you aren’t currently editing by clicking the colored boxes next to the course name on the “Calendars” list. This will help avoid confusion, especially when you have a lot of courses listed and some may have the same color. This can be overlooked for the multi-tasking gurus out there, but I’ve found it very helpful. For more information on manipulating assignments via the calendar, visit this helpful Canvas Guide.